One of the ongoing complaints about many data warehouse projects is that they take too long to delivery. This is one of the main reasons that many of us have tried to adopt methods and techniques (like SCRUM) from the agile software world to improve our ability to deliver data warehouse components more quickly. So, what activity takes the bulk of development time in a data warehouse project? Writing (and testing) the ETL code to move and transform the data can take up to 80% of the project resources and time. So if we can eliminate, or at least curtail, some of the ETL work, we can deliver useful data to the end user faster. One way to do that would be to virtualize the data marts. For several years Dan Linstedt and I have discussed the idea of building virtual data marts on top of a Data Vault modeled EDW. In the last few years I have floated the idea among the Oracle community. 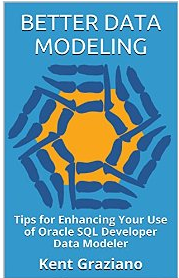 Fellow Oracle ACE Stewart Bryson and I even created a presentation this year (for #RMOUG and #KScope13) on how to do this using the Business Model (meta-layer) in OBIEE (It worked great!). While doing this with a BI tool is one approach, I like to be able to prototype the solution first using Oracle views (that I build in SQL Developer Data Modeler of course). The approach to modeling a Type 1 SCD this way is very straight forward. How to do this easily for a Type 2 SCD has evaded me for years, until now. So how to create a virtual type 2 dimension (that is “Kimball compliant” ) on a Data Vault when you have multiple Satellites on one Hub? Add a surrogate Primary Key (PK) to the table. The PK of the PIT table will then serve as the PK for the virtual dimension. This meets the standard for classical star schema design to have a surrogate key on Type 2 SCDs. Since the nullable Load End DTS is not needed, you can now more easily partition the Sat table by Hub Id and Load DTS. The main objection to this approach is that the virtual dimension will perform very poorly. While this may be true for very high volumes, or on poorly tuned or resourced databases, I maintain that with today’s evolving hardware appliances (e.g., Exadata, Exalogic) and the advent of in memory databases, these concerns will soon be a thing of the past. Worst case, after you have validated the data with your users, you can always turn it into a materialized view or a physical table if you must. So what do you think? Have you ever tried something like this? Let me know in the comments. P.S. 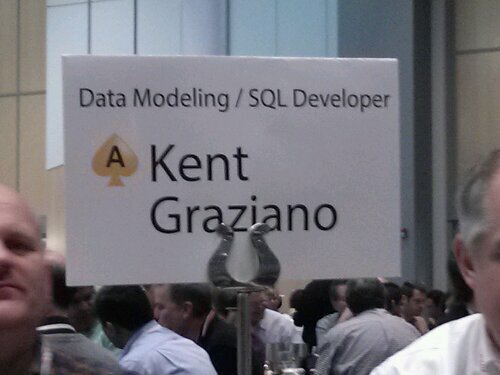 I am giving a talk on Agile Data Warehouse Modeling at the East Coast Oracle Conference this week. If you are there, look me up and we can discuss this post in person! Well, I can’t really talk about the meeting (yet) as everything is under NDA until next week (at least), but I can say it is great to get together with the top Oracle practitioners in the world and chat and discuss the issues and solutions in our field. It is like returning to the mother ship. With all the tech talk and product futures, there is also just general catching up, networking, and bonding. Much is learned over pizza and beer. Not the best photo of Chi Gung practice, but what are you gonna do. Lots more to come this week at Oracle Open World, so stay tuned for some very exciting announcements. This year’s ODTUG KScope conference is less than a month away and I am ready to get to New Orleans and meet up with all my friends and colleagues to talk shop and learn some new things. So in hopes of getting you to attend, I will share with you one of my productivity tips for using SQL Developer Data Modeler (SDDM). I love this tool. I use it every single day in my work building data warehouses for my clients. It’s easy – just right click on the table (or view) you want to check and Voila! Once you pick “DDL Preview”, then you get the DDL in another window. 1. Check the design to see if it is what you wanted/expected. 2. 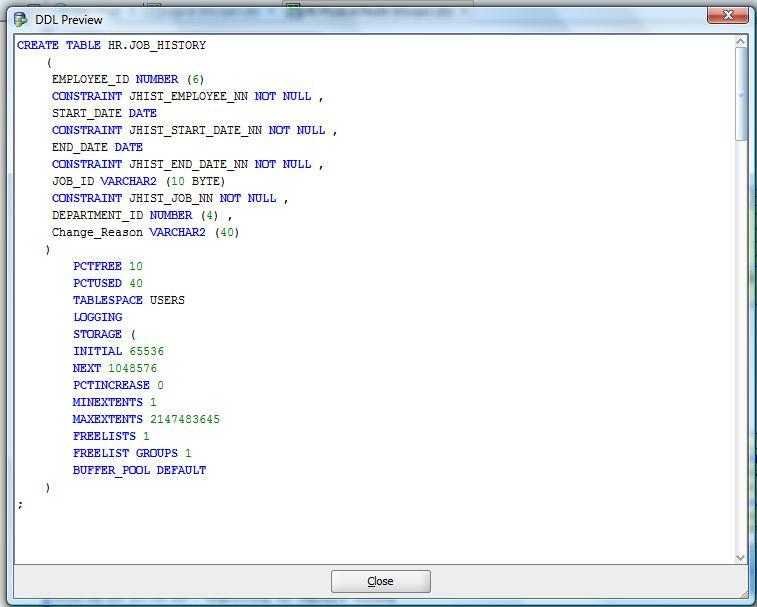 Copy and paste it to a worksheet in SQL Developer where you can then execute it (if you have the rights!). One more cool thing is that if you leave the DDL window open, you can now click on any other object in the open diagram and instantly see the DDL for that object. So there you go – really 3 tips for the price of one! If you want more, I will be presenting my Top 10 SDDM Tips and Tricks at KScope13 in New Orleans in a few weeks. So go register now! John is a great speaker and gave us some very detailed information. 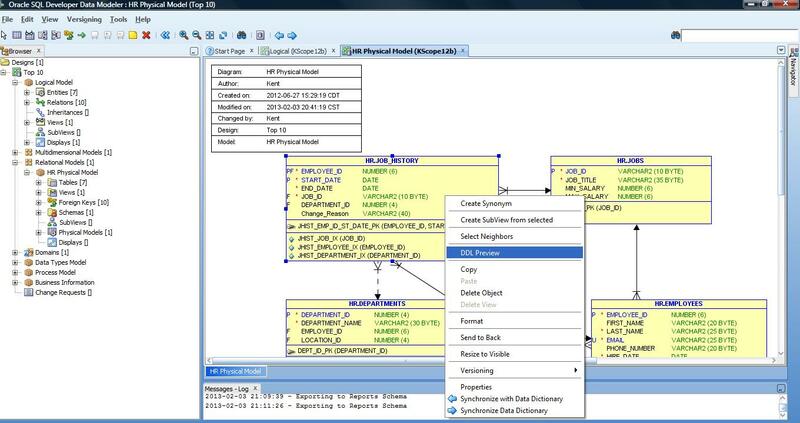 One very interesting piece to me, as a data modeler and data warehouse designer, was the addition of Virtual Columns. 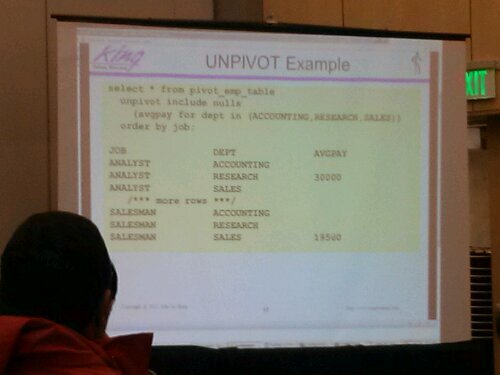 With this you can declare a virtual, calculated/derived column to be part of a table definition. With this you can define a calculation once and have it appear when querying the table without actually physically adding a column to the table. Looks promising. 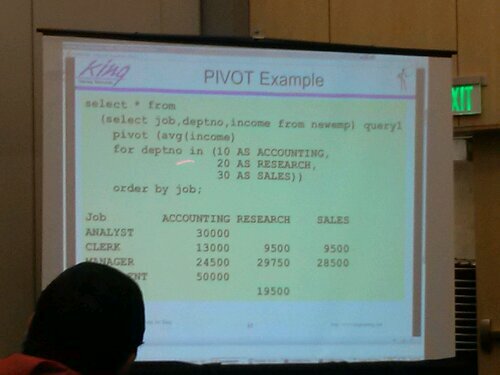 John told us about lots of new things like Pivot, Unpivot, Results Cache, PL/SQL Results cache and Nth Value functions. Some of them are shown in the following pictures. All neat options I did not really know about. Next up was the keynote speech by Mogens Norgaard from Denmark. Mogens is an ACE Director, CEO of his own consulting firm, and a brew master. Interesting guy. He showed up in his bathrobe to talk to us all about how the smartphone is taking over the world and all the cool apps you could build (and some he has built). Mogens Norgaard in his keynote best. 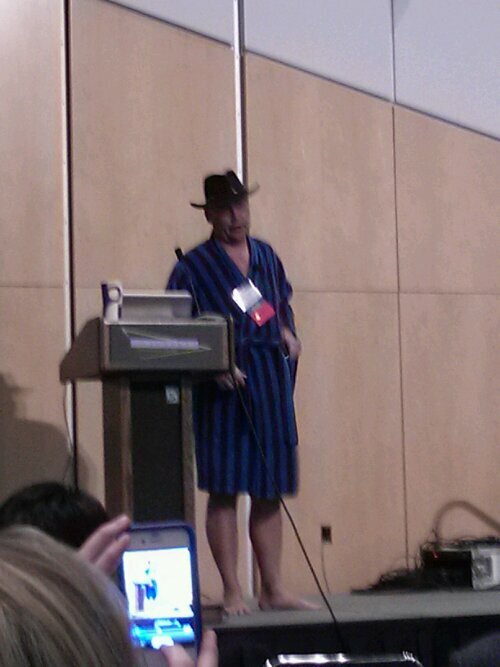 Next was my turn – my first session of the conference – 5 Ways to Make Data Modeling Fun (based on a blog post). 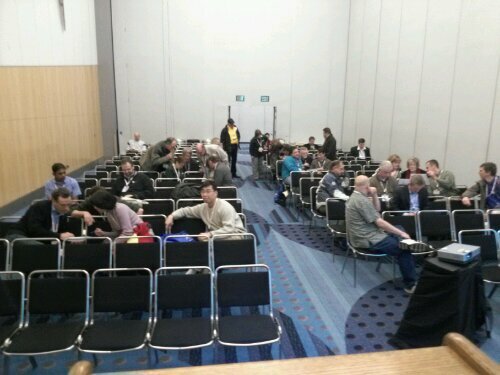 I was pleasantly surprised that I had 40-50 people attend and most stayed for the whole talk. It was a good, interactive session. My good buddy Jon Arnold assisted me in administering some of the activities. It was great fun getting the attendees to actually collaborate on activities during a session. As promised, I did give out prizes for some of the activities (all branded Data Warrior LLC stuff). Next was the ACE Director networking lunch where they put our names on tables so people could sit with us to ask questions (if they wanted too). 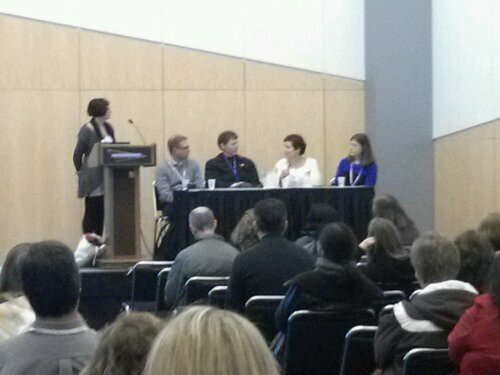 After lunch we some vendor sessions (which I skipped) and several panel discussions. These included the Women in Technology Panel and an Oracle Career Roundtable. 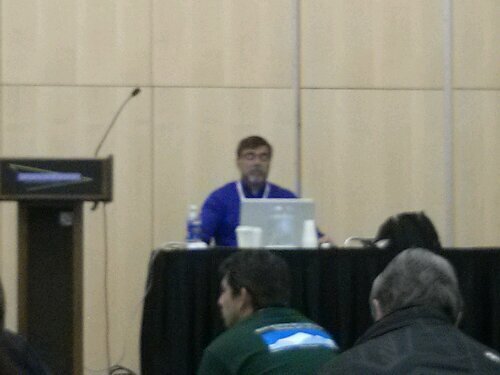 Next I sat in for part of a session on Oralce TimesTem database for real-time BI. 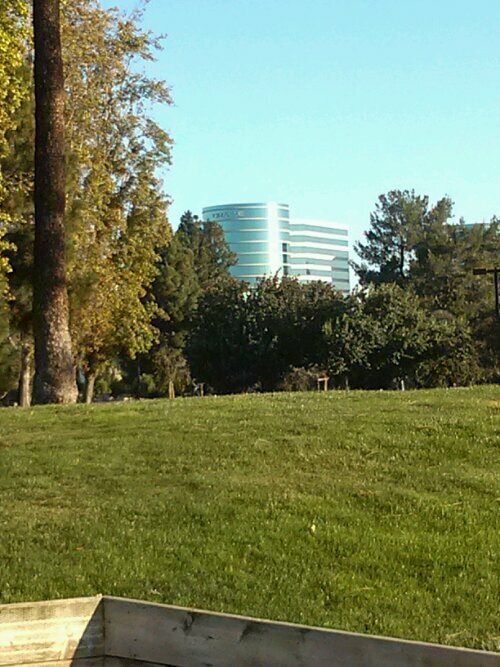 It turned out to be the same stuff I heard at Oracle Open World so I did not stay. 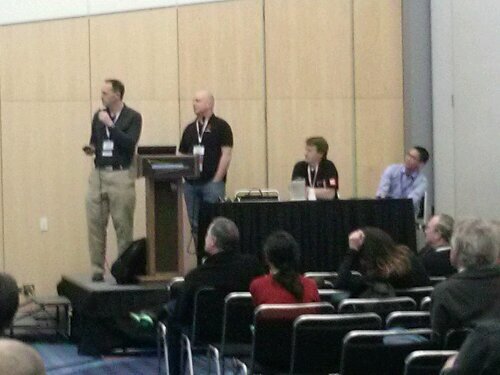 Last for my day at RMOUG was my joint session with Stewart Bryson on Data Vault and OBIEE. Unfortunately due to the late slot (5:15 PM) we had a very low turn out. 😦 But is was a good session as I discovered all the things Stewart learned trying to use the data vault model for virtualizing the data mart layer (in OBIEE). It was all very good and reinforced my belief that Data Vault is a great way to model an EDW and that non-data vault people could understand it and apply it to dimensional modeling (or that Stewart is really exceptional). P.S. Forgot to mention again that I will be conducting another morning Chi Gung class at & AM above the registration area. Please join!